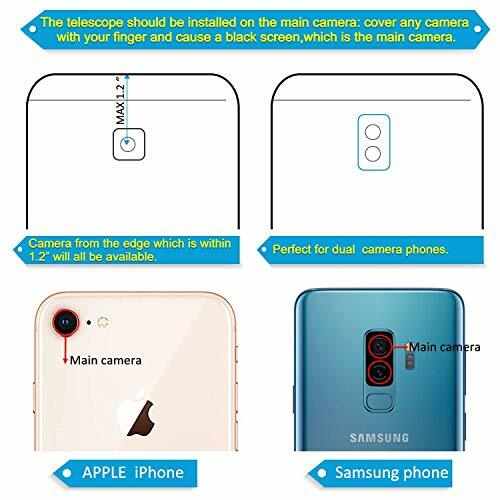 Product prices and availability are accurate as of 2019-04-14 23:06:58 EDT and are subject to change. Any price and availability information displayed on http://www.amazon.com/ at the time of purchase will apply to the purchase of this product. 1.For phones with dual camera, please attach it on the main one. 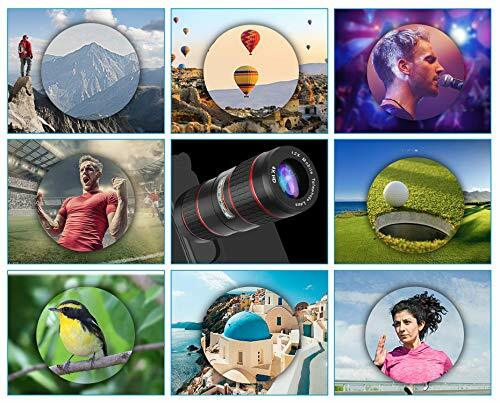 2.If the camera of the phone cannot take a clear image, you may have to manually fine-tune the focus by adjusting the focal ring. 3.This lens cannot change the pixels on your phone. Magnification is 12X high definition. The digital zoom function of the phone itself can used at the same time. 4.Remember photos look better when you have a steady phone screen. 1.Attach the clip to your phone and align it with the phone camera. 2.Rotate the screw on the clip to make it tightened. 3.Hold the clip and screw the lens on the clip. 4.ATTENTION:Please hold the clip to keep it in place while screwing the lens on the clip. 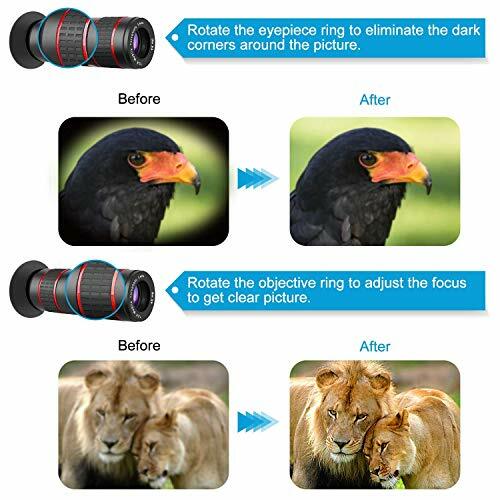 5.Rotate the ocular lens ring to eliminate shadows around the picture. 6.Rotate the objective lens ring to focus. 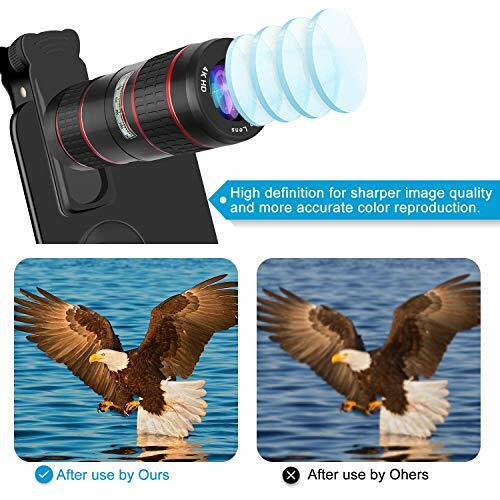 12X High Definition Telescope & Monocular Lens: 12X Phone zoom lens with double regulation of objective and eyepiece, can not only adjust the focus of the lens to bring your sharper image quality and more accurate color reproduction, but also can work as a monocular telescope giving you every opportunity to see the wonders of the world from a distance. Long Distance Shooting: The dual telephoto lens has a minimum focus distance of 10ft, it can't focus the objects close up. You will see clear and sharp images 12X closer and get brighter scope. 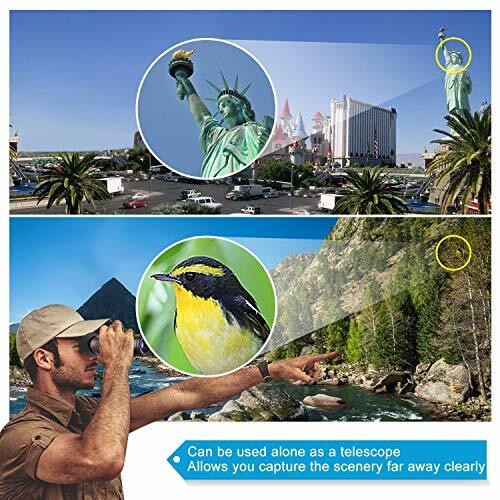 You can also use it alone as a telescope with the goggle on. 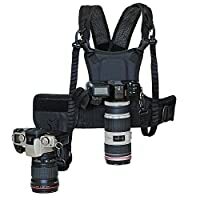 Lightweight & Portable: The 12X optical zoom lens with universal clip is portable and convenient for carrying in pocket. Ideal for camping, fishing, hiking, scope, sporting events, concerts and travelling. 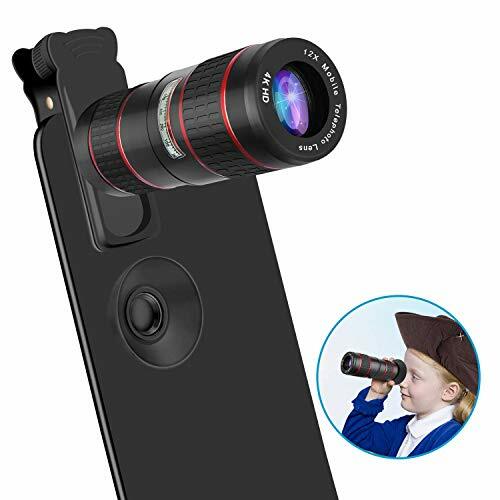 Wide Compatibility: Portable, removable and solid clip-on design that attaches to almost cell phone, it is perfect smart phone lens kit for iPhone XS Max, XS,XR,X,8/7/6S Plus, Samsung, LG, Google , and more. The center of camera from the edge of the phone which is within 1.2" will all be available. Warranty Replacement: 12 months replacement guaranty for 12X Phone Lens Kits. Any quality questions please contact with us first, we will refund for you even without returning the lens back.